Lexington, MA, April 21, 2016 - Daymark Solutions, a leading provider of information technology solutions, today announced that for the 7th year in a row it has been named by the Boston Business Journal (BBJ) as one of the Best Places to Work in Massachusetts. The honor recognizes Daymark’s achievements in creating a positive work environment that attracts and retains employees through a combination of employee satisfaction, work environment, benefits and overall company culture. This year's employers were once again selected based on blind survey responses provided by employees directly to the BBJ. 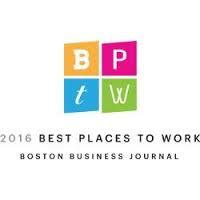 The BBJ's Best Places to Work surveys and the subsequent scoring of responses were provided in partnership with Quantum Workplace. “We are extremely pleased to recognize these companies that clearly value their employees and go the extra mile to create great workplaces," said Carolyn M. Jones, the Boston Business Journal Market President and Publisher. The BBJ will recognize this year's honorees — and count down each category's top-ranked places to work — during its 14th annual Best Places to Work event scheduled for the evening of June 23 at Symphony Hall in Boston. The Boston Business Journal is Greater Boston’s leading source of business news, information and events, reaching readers through the weekly print publication, the website bostonbusinessjournal.com and e-mail products. The BBJ also prints the annual Book of Lists — the region’s top resource for business decision-makers seeking information about potential clients, suppliers and partners. The Boston Business Journal is published by American City Business Journals, the nation’s largest publisher of metropolitan business news.